August 24, 2013 - Boeing has completed the first 787-9 Dreamliner. The second member of the super-efficient 787 family rolled out of the Everett, Washington factory today to the flight line, where teams are preparing it to fly later this summer. At 20 feet longer than the 787-8, the 787-9 will extend the 787 family in both capacity and range, carrying 40 more passengers an additional 300 nautical miles. 787-9 Dreamliner will seat 250 – 290 passengers in three classes with a range of 8,000 to 8,500 nautical miles. When launched, the 787-9 had the same fuel capacity as the 787-8. The design differences meant higher weight and resulted in a slightly shorter range than the 787-8. After consultation with airlines, design changes were incorporated to add a forward tank to increase its fuel capacity, providing the aircraft with a longer range and a higher maximum takeoff weight than the 787-8. The 787-9 leverages the visionary design of the 787-8 such as its exceptional environmental performance 20 percent less fuel use and 20 percent fewer emissions than similarly sized airplanes and passenger pleasing features. 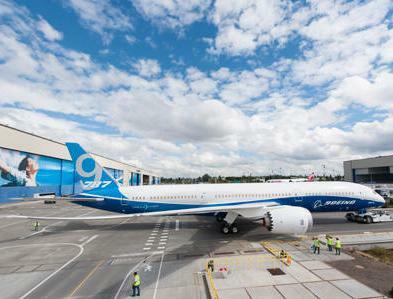 With the second and third airplanes in final assembly, Boeing and the 787-9 are on track. First delivery to launch customer Air New Zealand is set for mid-2014. The Boeing 787 Dreamliner is a long-range, mid-size wide-body, twin-engine jet airliner. Its variants seat 210 to 330 passengers. Boeing reports 787 Dreamliner is the company's most fuel-efficient airliner and the world's first major airliner to use composite materials as the primary material in the construction of its airframe.